Intel’s new Coffee Lake family of 6 and 4 core CPUs has reportedly been delayed to February of 2018. The news comes courtesy of the latest desktop roadmap which the company had presented to partners at Computex according to WinFuture.de via Golem.de. The company will be introducing three product families over the next four quarters. The first is the high-end Core X series which the company introduced last week and includes Skylake X and Kaby Lake X CPUs and the X299 Chipset. These will include four core Kaby Lake X i5 7640X and i7 7740X CPUs as well as the 12, 8 & 6 core i9 and i7 Skylake X 7920X, 7900X, 7820X and 7800X CPUs, whilst the 18, 16 and 14 core parts will see a delayed launch. The second family of products from the company will be aimed towards the mainstream market and will feature Intel’s six core and quad-core Coffee Lake CPUs and Z370 chipset. Intel has reportedly postponed these 8th generation parts to February of next year. Earlier reports indicated that the company had been attempting to push the launch to the second half of this year. However, if this recent report regarding the company’s latest roadmap is anything to go by, the company will now be launching refreshed Kaby Lake parts this year instead and postponing Coffee Lake to 2018. The new family will not be compatible with current LGA 1151 boards and will require a new revision of the LGA 1151 socket dubbed the V2. These processors will feature 6 core, 12 thread i7 parts and 4 core, 8 thread i5 parts. 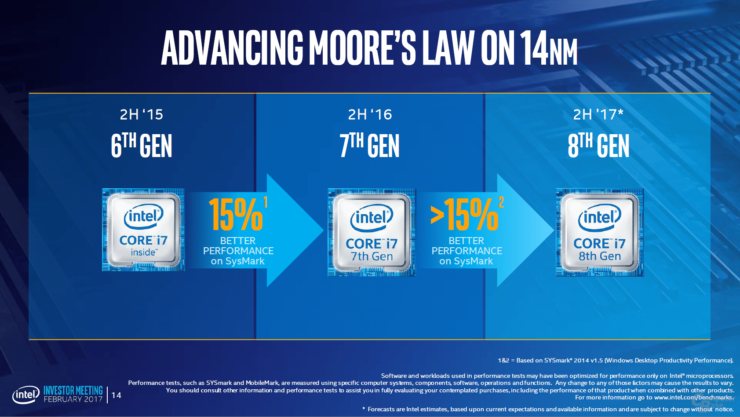 This represents a substantial step away from Intel tradition of sticking to four cores for this segment. These higher core count processors are now a necessity to compete with AMD’s Ryzen in the mainstream. It’s important to note that only a partial number of Coffee Lake SKUs will be available at first. The majority of Coffee Lake parts and 300 series motherboards will follow later in Q1 2018. For its 8th generation processors the company is said to be introducing a Kaby Lake refresh instead of Coffee Lake this year. The new 15W Kaby Lake U parts will double the core count from 2 to 4 and are said to deliver up to 30% better performance for Ultrabooks. They will be available in time for the back to school season. The third family of products is based on Intel’s BGA Gemini Lake chips which will feature 2 to 4 cores on a frugal TDP of 10W. These parts will be targeted towards small form factor machines and low power designs and will all be fused into motherboards. These chips will likely be popular amongst OEMs and PC manufacturers for HTPCs and NUCs. If you’re a DIY builder you’ll want to stick to the socketed parts instead. Gemini Lake is now scheduled to debut at the end of the year.